A healthy mouth is part of a child's overall health. Children need strong, healthy teeth to chew their food, speak and smile. Your child's teeth also help give his or her face its shape and keep space in the jaw for adult teeth. A baby's teeth start to come in when the baby is about six months old. Baby teeth will later be lost one by one. This makes space for adult (permanent) teeth. By the time children are teenagers, they usually have all of their adult teeth. The last four teeth that come in are the wisdom teeth. The charts below tell the names of the baby and adult teeth. The pictures show when each tooth usually comes in and is lost. But not all children get the same teeth at the same times. 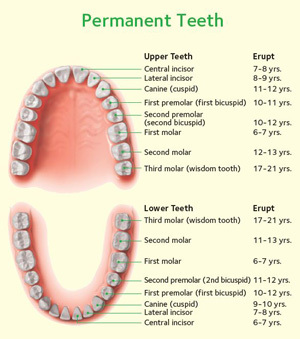 Your child's teeth may erupt earlier or later than the ages in these charts. 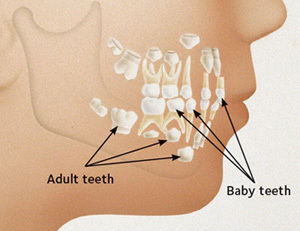 Adult teeth start to form under the baby teeth. After the baby teeth are lost, the adult teeth will come in through the gums. 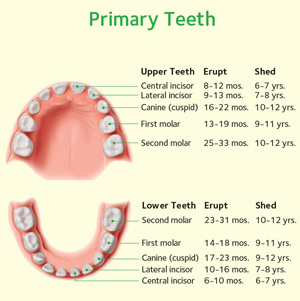 Most children go through a stage when they have a mix of primary and permanent teeth. During this time the smile can look uneven, with some big teeth, some small teeth, some crowded teeth or maybe even some missing teeth. Try not to worry. Smiles often even out once all the permanent teeth are in place. 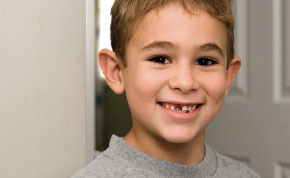 When your child is about age seven, the dentist will do a "bite check" to make sure your child's adult teeth are coming in properly and that the back teeth are working together the way they should. You dentist may also take an x-ray of the teeth. If your child's teeth or bite need treatment, it's best to get an early start.